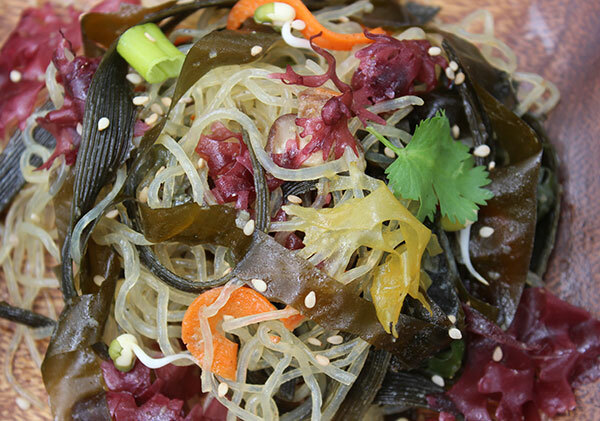 This is our homemade seaweed salad recipe that utilizes some of the common dried seaweeds available in most U.S. health food stores or can be ordered from online suppliers. 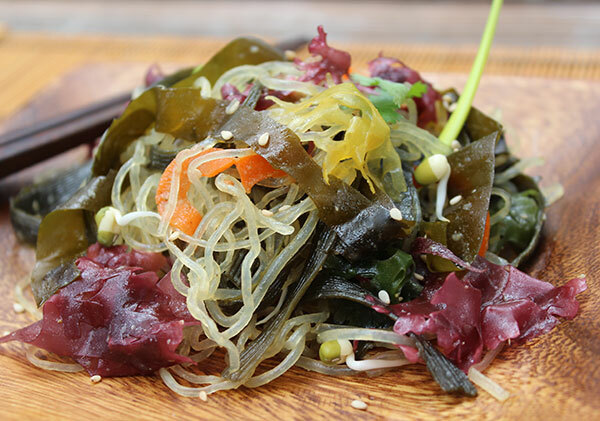 While some of these are not your typical varieties used in Japanese seaweed salads, they are some of the most nutritious of the sea vegetable types. 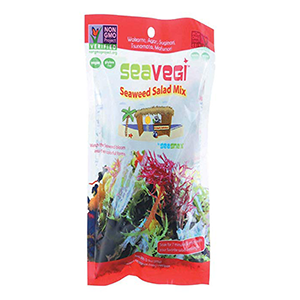 We also prefer using seaweeds that are tested, organically grown or sourced from more pristine marine environments located primarily in the Northern Hemisphere. When you make your own homemade salad, you get the opportunity to choose from some of these higher quality selections. 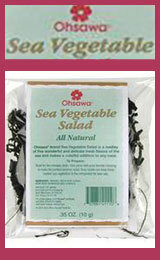 When choosing seaweeds for marinated salads, it is important to pick varieties that are tender when rehydrated. Thick pieces of kombu, in other words, are not ideal for creating the best textural quality as they are too tough and mucilaginous. 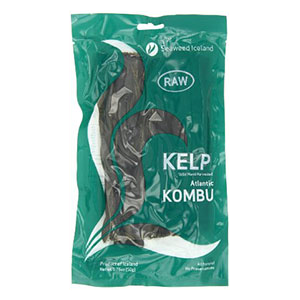 The best types we have found are the softer whole sea vegetables, specifically laver, sea palm, dulse, kelp whip and wakame. These either come in thin long pieces or can be cut after soaking with kitchen scissors to provide a pasta-like salad that is easy to eat and enjoy. 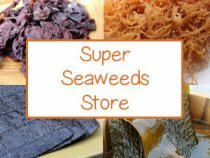 Many of these seaweeds can be purchased from reputable company's based in Canada, Iceland or the northern Atlantic coast. 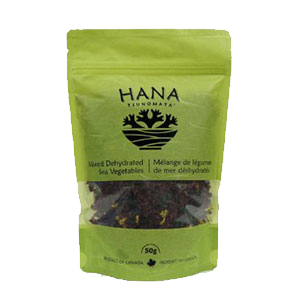 We have also found one brand by Acadian Seaplants, called Hana Tsunomata, that offers three different Japanese-style tsunomata seaweed species that are organically grown in a controlled environment off the coast of Nova Scotia. These have a ruffled appearance, similar to the Chondrus crispus or irish moss species, and can provide a much more suitable replacement for those harvested in Japan and typically used in seaweed salads. In this recipe we attempt to blend those we consider to be highly nutritious together with the tsunomata varieties known to provide naturally bright color variations and a consistency close to Japanese salad combinations. 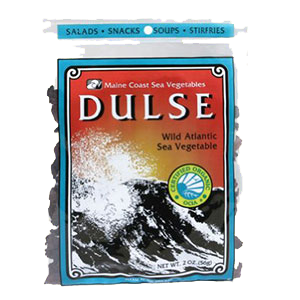 Seaweeds like dulse and kelp (wakame and sea palm) are some of the best sources of polysaccharides, minerals and trace minerals, like iodine. 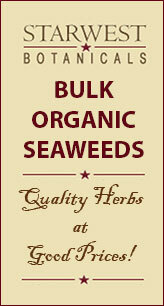 When it comes to purchasing seaweeds, quality is especially important. Because sea plants are farmed or foraged wild from seawater sources, it is good to make sure they have not been exposed to potentially harmful substances, like petroleum residues, radioactive isotopes, sewage waste, pesticides and herbicides or heavy metals. 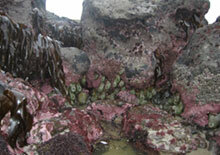 It is therefore good to buy varieties that, not only come from pristine ocean waters that are less likely to be exposed to these toxic substances, but also seaweeds that undergo thorough independent lab inspection to monitor potential impurities and/or have taking measures to offer organic certification. Most seaweed cultivated or wild harvested off the coast of Japan close to the 2011 Fukushima disaster, for example, are not likely safe to consume. In a 2014 study published in the Journal of Plant research it was noted that radioactive cesium accumulation in seaweeds is used as a biomarker to indicate levels of seawater toxicity from the Fukushima Nuclear Meltdown. In addition, it was evidenced that "Contamination was still detectable in many samples in March 2013, 24 months after the most significant pollution." Certain Japanese species, commonly seawater farmed in these regions, are often the ones used in salad preparations. This may include varieties like tsunomata, suginori and mafunori. Arame and hijiki seaweeds are also predominantly grown in these locations. 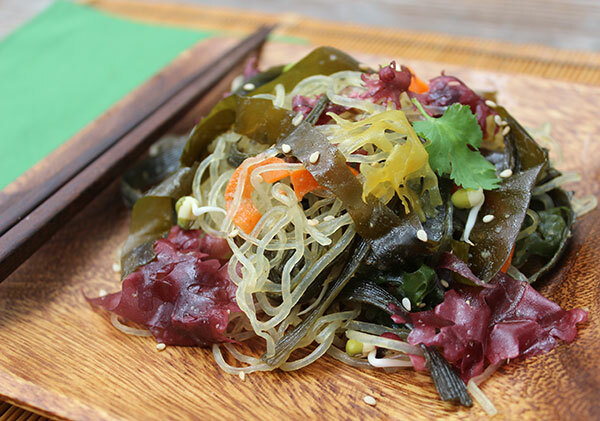 There are several packaged mixes on the market today, but nothing comes quite as close to making your own homemade seaweed salad from seaweeds you can select yourself, using the best quality available for highest nutritive value and health enhancing benefits. Many of the prepackaged salad blends can additionally contain MSM as well as artificial colors or dyes. 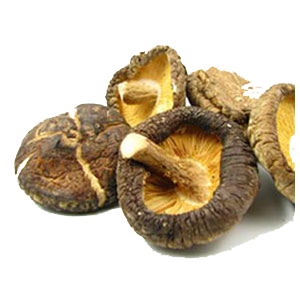 These are substances added to improve flavor and create aesthetic appeal. 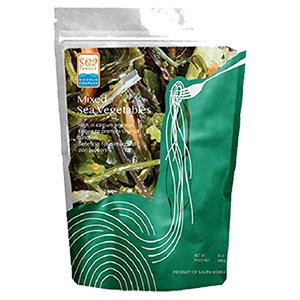 Dried seaweeds, which usually come in bulk quantities, are great to have on hand for a last minute seaweed salad creation. 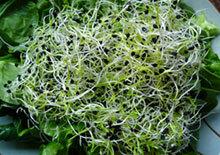 They are, moreover, much more cost effective if you like to frequently use sea vegetables as a salad alternative. 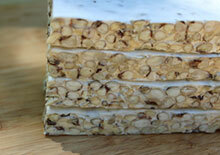 They make a nice side dish for homemade sushi rolls, miso soup as well as grilled tempeh. 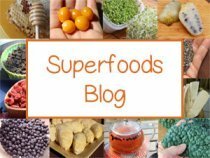 In this recipe we use kelp noodles, a product that has become very popular these days for making raw pasta dishes or raw pad thai. We also use them in our mac-n-cheese recipe. 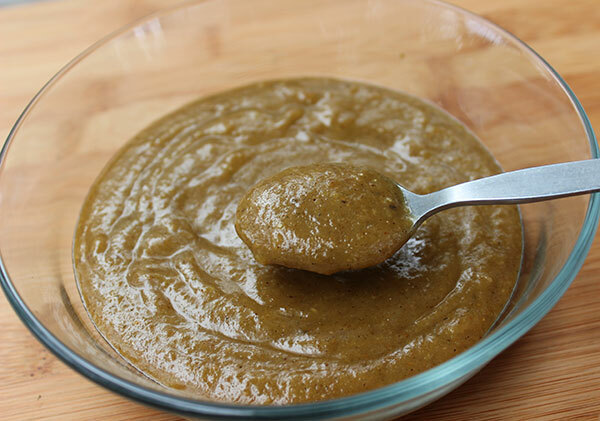 They are a fairly recent invention found in many Western health food stores and are basically made from the sodium alginate or algin extracted from raw kelp species. 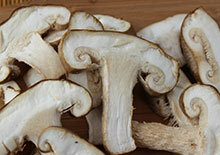 After slight processing this produces a clear noodle-like shape, perfect for a seaweed salad base ingredient. They are best when softened slightly by soaking in hot water and marinated, otherwise they tend to have a crunchy texture. 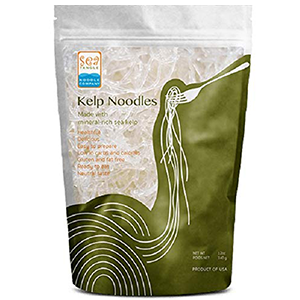 In our opinion, there are basically two ways that kelp noodles taste the best. 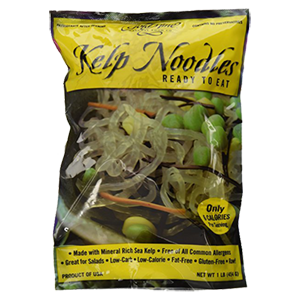 1) Soaked - Soak the kelp noodles in hot water with the juice of half a lemon for 1 hour OR soak in hot water and marinate in a dressing for 1 hour. 2) Blanched - Blanch the kelp noodles in boiling hot water for 30 seconds for an instantly soft noodle or add directly to hot soup broths. 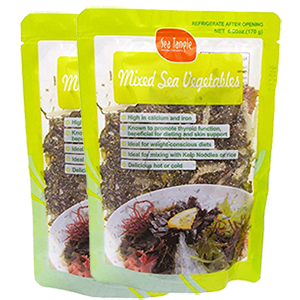 You will need to soak your dried seaweeds in filtered warm water to create a soft and pleasant to eat texture. Most types will swell up to about 4-5 times their dried state. Wakame and sea palm take about 30 minutes to fully tenderize. Tsunomata and kelp whip take about 10 minutes. 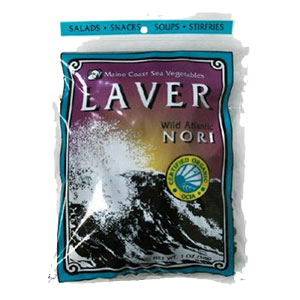 Laver and dulse can be cut and added dry as they will absorb moisture from the dressing. 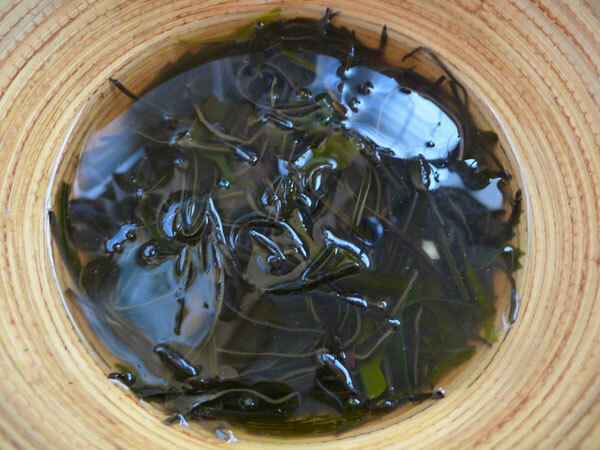 Whole seaweeds should be further sliced into strips after soaking and straining. 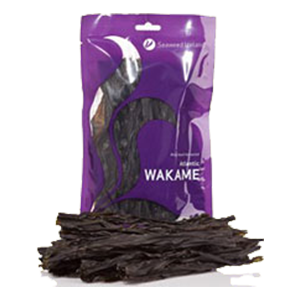 If you are using wakame, it is best to remove thick tough center. 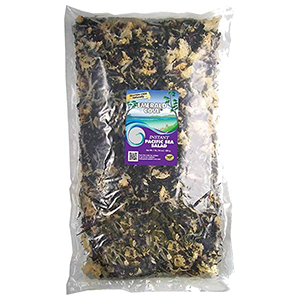 It is a good idea to pat dry your soaked and strained seaweed with a clean towel to remove as much moisture as possible. 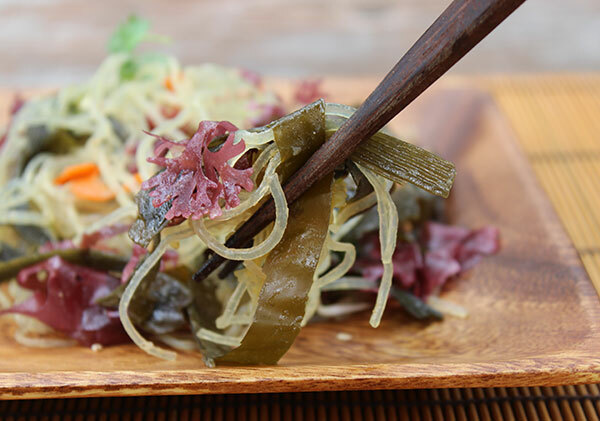 This seaweed salad recipe is a delicious way to eat a concentration amount of mineral-rich seaweed in one small salad portion. 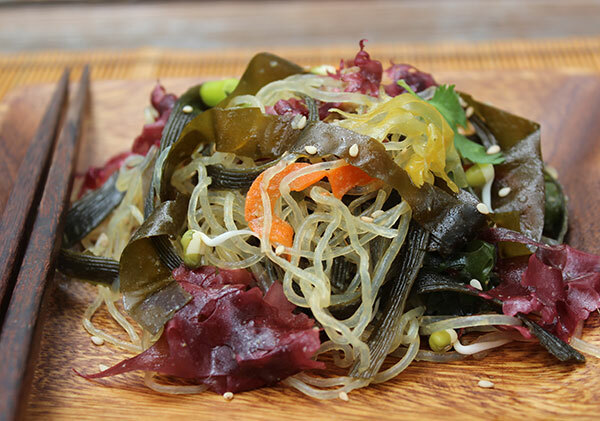 Marinated in a sweet sesame miso dressing, using stevia and raw honey, it is more like a "seaweed pasta" than a vegetable or green leaf salad. Blend all ingredients in a high speed blending device to produce a thick consistency. If you are going to use mung bean sprouts they need to be soaked and sprouted about 1-2 days before you make this recipe. 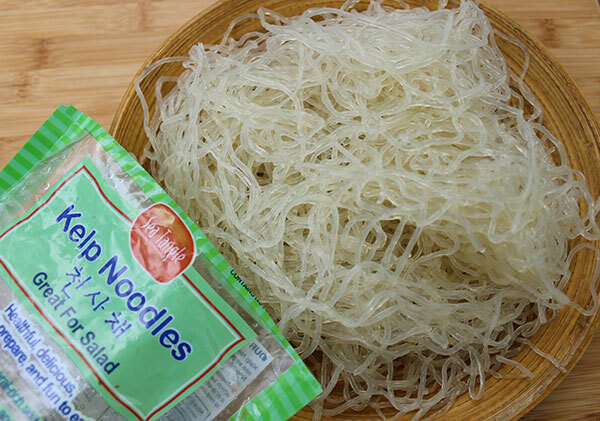 Rinse and blanch kelp noodles in hot water. 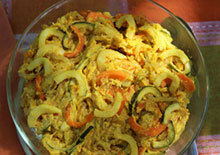 Thoroughly mix the kelp noodles with the sesame dressing (using the recipe above) and set aside in a large bowl. Soak your seaweeds in warm water for 10-30 minutes, then strain, pat dry and cut into long strips or bit size pieces when necessary, set aside. Process carrot in a food processor using the grating blade or use a vegetable spiralizer, add to bowl of kelp noodles along with steamed shiitake, scallions, cilantro and mung bean sprouts. Mix with your clean hands or utensil. 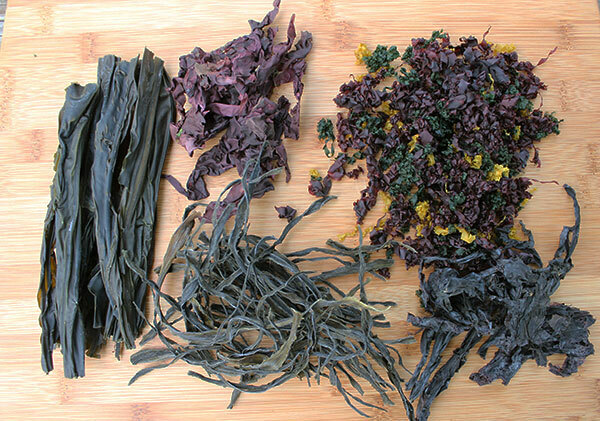 Add the remaining soaked and strained seaweed strips or pieces as well as dried laver and dulse. This makes a big bowl of seaweed salad usually enough for 10 small servings. It can be served immediately (especially when kelp noodles have been blanched beforehand) or marinated for several hours or overnight. It will last for 2-3 days in the fridge if you have happen to have extra. 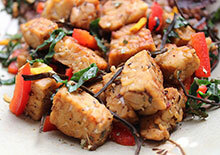 It is a great side dish to sushi, miso soups and tempeh dishes (using our homemade tempeh recipe) or as a salad accompaniment to some of our other high raw vegan recipes. Remember to always thoroughly chew your seaweed for best digestion and nutrient absorption. 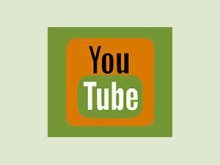 There are also many additional ingredients you can add to this recipe over time. 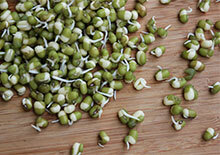 Different sprouts varieties, like onion sprouts, can be used as an alternative to scallions.